The problem for most people with Kuranda is that there’s too much to do and not enough time. The problem for most people with Kuranda is that there’s too much to do and not enough time. Just north of Cairns, this is a place for embracing nature in all its fine and wild forms. 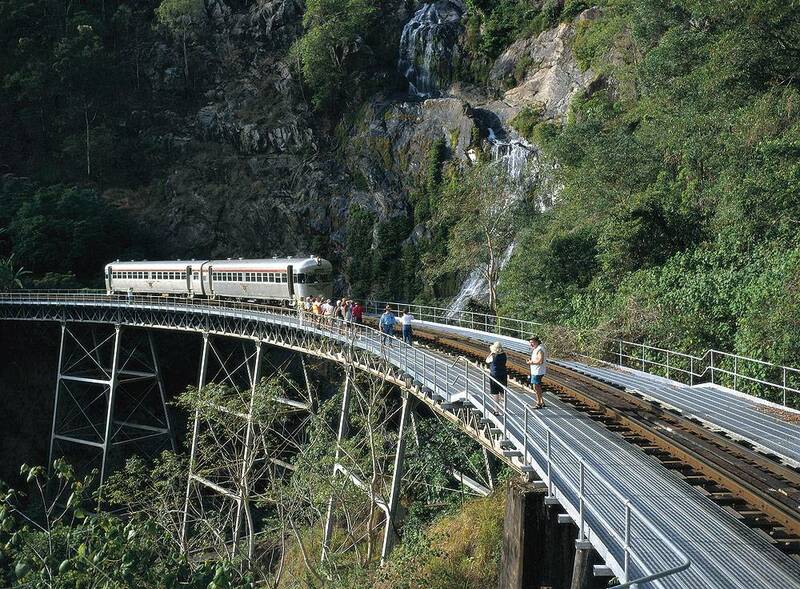 Locals think of Kuranda as a village, evolved from a background of markets. Hit the shopping today and you’ll find the original markets of yesteryear now standing as cultural stores of gems, art and just about everything you can think of. There’s a Butterfly Sanctuary, Koala Gardens, Bat World sanctuary and even a Venom Zoo, just to name a few. World Heritage rainforest surrounds mountainous Kuranda, but this heavily protected area isn’t entirely impossible to penetrate. The Skyrail Rainforest Cableway – spanning 7.5km over the rainforest – is one way; the Kuranda Scenic Railway is quite another. Constructed between 1882 and 1891, with hundreds of men employed and many lives lost, this working monument runs up the side of the mountain and through the ancient rainforest. The fascinating 1hr 45min trip from Cairns to the original Kuranda Railway Station, rising up 328m from sea level is one heck of a scenic ride. Where? // 29km (30min) northwest of Cairns. Did you know? 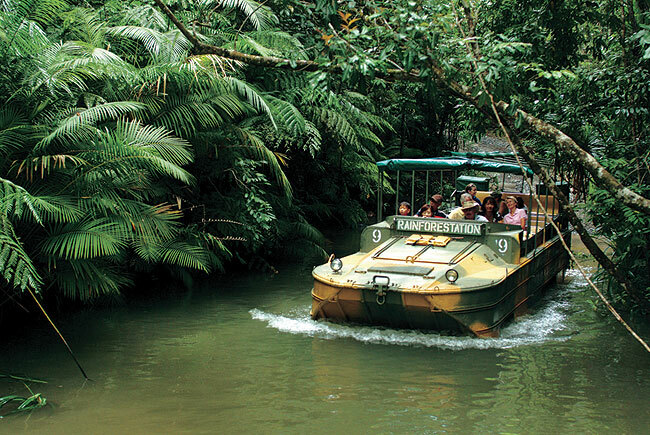 // Yet another way to explore the deep rainforest surrounding Kuranda is to throw caution to the wind and take a 6WD amphibious Army Duck ride through it (left).